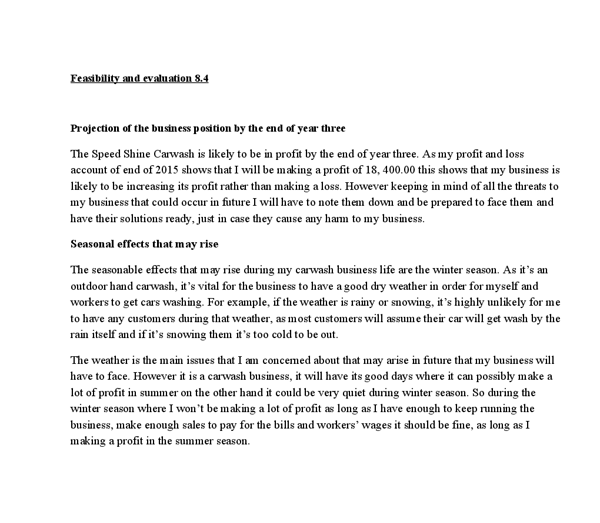 ﻿Feasibility and evaluation 8.4 Projection of the business position by the end of year three The Speed Shine Carwash is likely to be in profit by the end of year three. As my profit and loss account of end of 2015 shows that I will be making a profit of 18, 400.00 this shows that my business is likely to be increasing its profit rather than making a loss. However keeping in mind of all the threats to my business that could occur in future I will have to note them down and be prepared to face them and have their solutions ready, just in case they cause any harm to my business. Seasonal effects that may rise The seasonable effects that may rise during my carwash business life are the winter season. As it?s an outdoor hand carwash, it?s vital for the business to have a good dry weather in order for myself and workers to get cars washing. For example, if the weather is rainy or snowing, it?s highly unlikely for me to have any customers during that weather, as most customers will assume their car will get wash by the rain itself and if it?s snowing them it?s too cold to be out. ...read more. Another strength is that it?s relatively cheap to set up and I can always upgrade the products once there is enough money made, also employees will not need any necessary training unless using technology like computers, software etc. In this case I won?t have to spend money for employees to train. 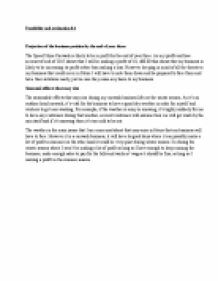 Weaknesses The weaknesses of opening up a carwash business are firstly that weather is unpredictable which could affect the money my business makes. For example if it is raining the business is unlikely to maximize the sales unless I provide a roof or shelter which would cost the business money but would it be worth it? Therefore this is the first weakness of having an outdoor hand carwash. Secondly if what if my business doesn?t satisfy the customer?s needs, then the reputation of Speed shine will go down and it could be the end of the business with bad reviews, for example if my workers are rushing to get cars washed and provide poor quality service to the customers then will leave my business losing those customers, and ending up having a bad reputation and those customers would go to my competitors. Opportunities The opportunities of opening up a carwash business are that the business can expand and have more than one chain in future, if my carwash runs successfully, which in my case in ...read more. Personally I found the perfect location in Chigwell but the cost was well too high and to finance the cost of having a carwash in Chigwell was going to cost up to a £900,000. This is very expensive compared to the £75,000.00 I am paying a year but as a matter of fact, Chigwell’s location makes it the ideal place where I could get a return quickly because the economy of the area is very sustainable but not only that, it is surrounded by millionaires who can have up to 6 cars to wash making it very attractive to move into. Perhaps this is something to look for in the future but for now I am happy with the location as it is in Chad well heath because it has the potential to have a major success in the market and I have the potential to make it one of the leading car washes in the UK. I have learnt a lot about myself as well because I thought at the beginning that this would be easy to do on my own but you do need people around you to just be your safety net just in case you fall. I don’t want a partnership due to my personality but what I would want is a friend or family members helping me so that I can have their experience and transfer it to my business. ...read more. Another thing that Virgin Atlantic would need to know is how often do consumers go abroad to take part in leisure activities, as this will let them know where they need to fly to more and to create the perfect package for their flyers that fly to the more exotic places for their own hobbies or leisure activities. the top 100 drinks companies in the world (Datamonitor Computer Wire, 2006). In 2005, F&N Coca-Cola (M) Sdn Bhd lead the Malaysian soft drinks market with a 36% off-trade volume share, while YHS (M) Bhd lead the market with a 9.6% off-trade volume share (Appendix 2). However a great advantage of this liability is that you will not lose anything personal to you. Unlimited liability means that the owner and its business share the same identity consequently if the business does get into any debts then it will be their responsibility to pay for the debts if the business could therefore not pay for them. Travel agencies 'Excursus' main activities: 1. Cognitive - recreational travel by bus around Europe; 2. Trips in Lithuania; 3. International children's and youth camps in Europe; 4. Leisure air travel; 5. Individual travel arrangements; 6. Bus rent. UAB "Excursus" key activities is a trip for kids and the whole family, children and youth international camps, travel long edges (Israel, Thailand, Mexico).